“After the first quick, simple trip to visit friends in Swaziland, Africa in May of 2011, God clearly showed me that He was calling our family to partner with our full-time missionary friends and to join His work there in the community of Lesibovu on a long-term basis. It was with great joy that the next summer, my husband James and I traveled with a team including our two oldest children and several friends from church. The next summer, our team consisted of more local friends, and the same 4 members of our family. Then, a season of wandering and wondering what He was doing. It was a long, nearly three year season that still brings up many emotions as I type it out. Those 2 years and 10 months between our last trip and this most recent one? So much has transpired. Trips planned. Minimally successful fundraisers. Discouragement. Health crisis. Surgery. Job change. Financial stress. Redirection. Lots of waiting. Prayers answered with “not now.” Trip postponed. Another year. Hope building. Another tentative plan. Then, another trip cancelled. Excitement over possible partner in ministry. Disappointment in silence and lack of response. Struggle to be faithful and continue to work. The GKC family and others continued to remind us that even when our good plans do not pan out, the best kind of good can come from those times. Our missing the precious ones in Swaziland was so difficult. Our hearts longed to see and tell them we hadn’t forgotten and we wanted to be there. We know how fragile life is, especially in Swaziland, and we feared not seeing some of the same children whenever we could return. Fear fought to control our thoughts. We felt so responsible to meet expectations and needs and to be present, in their community, to remind them that Jesus was faithful–while also struggling to remember that Truth ourselves. The irony wasn’t lost on me. 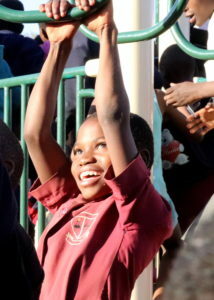 Then early this year I heard amazing news from our partner ministry, Children’s HopeChest. A lady who has a passion for the Lord and with considerable means and financial resources had approached them, and desired to use her resources to invest and build a legacy in Swaziland. She wanted to commit to helping a specific community reach self-sustainability over several years. They had encouraged her that Lesibovu was the place in greatest need and she was in agreement and wanted to visit it soon. A trip that HopeChest was giving their blessing to, with a second partner ministry (Kids Around the World,) was in the works. 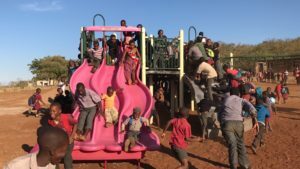 The goal was to build a huge playground through Kids Around the World for this community as part of a trip she desired to take 8 family members on in May. Would we like to join them? I am sure I responded positively at some point, but I know I cried out of sheer astonishment. I had prayed God would give us more connections maybe throughout our county, or even statewide here in Alabama. But this lady – do you know where she is from? God connected Teri from the Los Angeles area of a state clear across our country, with us, using a ministry in Colorado and another one in Indiana, to join forces and serve for a couple of weeks in southern Africa. You know what I keep learning and relearning through this? His plan is so much bigger than we can imagine. His ways are completely beyond ours. Beautiful messages of encouragement from friends. Trust built as we had to wait to see His purpose unfold. Realization that we aren’t meant to be the answer to the needs of others – only Jesus is. Time poured into outreach and work on fundraisers were blessings and done over time, not packed into one short period. The blessing of deepening faith for the Swazis who relied on their Father instead of Americans. Unity between teammates with vast differences of personality, background, and resources serving with a common focus and goal. 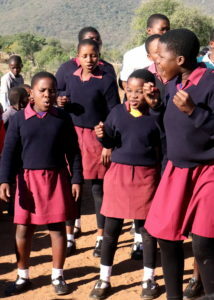 Prayers for God to give us a much wider audience to reach with news of the work He is doing in Swaziland were answered. He was glorified! Thank you to many of you who have supported and prayed for this ministry. We deeply appreciate the family of Grace Klein Community for providing loyal assistance with fundraising, networking, and sharing of the struggle and the joy that come with ministry. We continue to pray about future service to the community of Lesibovu and what the Lord has planned for us next. We covet your prayers most for the full-time servants who give so much to the country of Swaziland daily. It is a gift to us anytime we are able to share the load just a bit with them. Their faith and selflessness are inspiring and beautiful. I love these verses from The Message’s version of my favorite New Testament chapter. Paul wrote about God’s goodness shown in the Mystery of Jews and Gentiles being on equal standing before Christ – something at first absolutely beyond comprehension to those in the early Church. If He can do this, why do we ever doubt His ability to handle our concerns or fears?